Robert Soto, pastor of the Grace Brethren Church of McAllen, Texas, and former GBNAM church planter, has posted a wide-ranging update on his ministry to Native Americans on the GBNAM website. 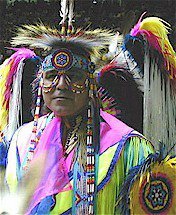 Through his unique ministry of traveling and dancing Native American dances, Robert reports that nearly 2,700 people have come to the Lord in the past two years. To read his complete update, posted by permission, click here. We are starting our second Native church. We will be starting a new church in San Antonio Texas which is about 250 mile from here. We will meet once a month for the next twelve months and see where the Lord take the ministry. My prayer is that I can find a man to disciple and have him take over the ministry within two years. Our first meeting is this Saturday. I will be taking eight of our church members to help me. So that means that once a month we will drive five hours to San Antonio and back. San Antonio is the home to about 15,000 Native American and no one is making an effort to reach out to them except me once a year when I take our church to their annual pow wow.